A simple, creamy and delicious Aloo-Gobi Masala goes good with any Indian bread and rice. 12. Red Chilly Powder - 3/4 tsp or adjust to your taste. 1. Heat a little oil. Fry mint leaves and keep aside. 2. Again in the same pan, heat another teaspoon of oil. Add chopped tomatoes and cashew. Saute for few minutes. Remove from stove. Let it cool down. Grind and keep aside. 3. Meanwhile, half-cook cauliflower and potatoes in a microwave or on stove top. 4. Now, add the remaining oil in a pan. Add cumin and fennel seeds. Fry for a minute. 5. Add grated ginger, chopped green chilles and bell pepper. Saute for few minutes. 6. Add half-cooked cauliflower and potatoes. Saute them well. 7. Add coriander powder, garam masala, red chilly powder and salt. Mix them well with the contents already in the pan. Keep sauting for few minutes. 8. Add ground tomatoes and cashew mixture to the pan. Let them cook for few minutes. 10. Switch off the stove. Stir-in the yogurt. Love the colour! Looks awesome! Nice combo and yummy masala. Perfect with chapathis. its looking gr8..addition of capsicum gives it a dfferent flavour...love it. Looks so yummy..Aloo-Gobi is a deadly combo..
Wow,indeed sounds creamy ,nice recipe! dish looks absolutely vibrant n inviting...lovely picture Nithu..
get the chapathis...the curry looks wonderful! 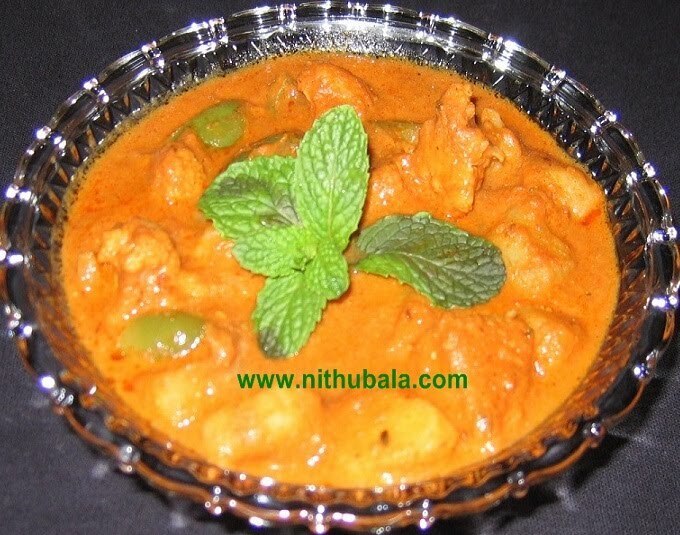 Thats a yummy masala, would love to have with some rotis..
Lovely and colourful spicy curry...droolworthy ! :-) You are always a WINNER!!! Looks so adorable and drool-worthy! You have an award in my blog, pls come and collect it. Hi, first time here:) Your recipes are so delicious and all look great! I am looking forward to trying some of them out. Have a great day! Love your gravy dear, beautiful presentation. nice curry... looks so yummy. i like ur blog.wonerful! We had never tried a milk based gravy so were a little 'curious'. Does this come from any particular part of India ? ?